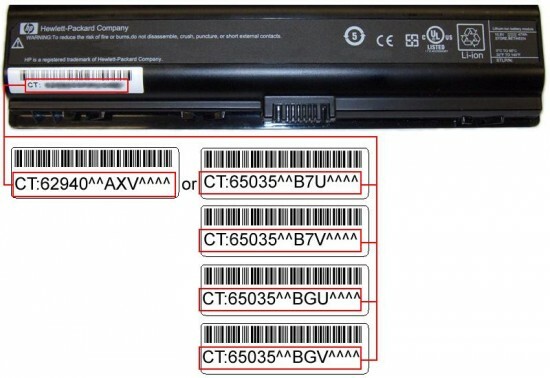 New Breed of Low Cost Laptops to Come, Courtesy of Windows 8? Love it or hate it, but Windows is still the most used operating system around the world. Reasons range from convenience to price to habit to loyalty, but if rumors are to be believed, there is another reason for people to continue patronizing Bill Gates’s major software product. In the foreseeable future, we are going to see the launch of Windows 8. And while countless people are too focused on the launch of Apple’s Lion (and the MacBook Airs!) today, there is no doubt that when the time comes, Windows 8 will get its fair share of coverage. More than the operating system, though, the rumors are also highlighting a probable consequence – the boom of a new breed of low cost laptops. No matter how you look at it, price is always a prime consideration for many buyers. We may all want the best specs, but sometimes, the price is a big hindrance. So what is the link between the upcoming Windows 8 operating system and laptops that won’t break the bank? According to Matthew Wilkins, an analyst at t IHS-iSuppli, the reason is the ARM processors. 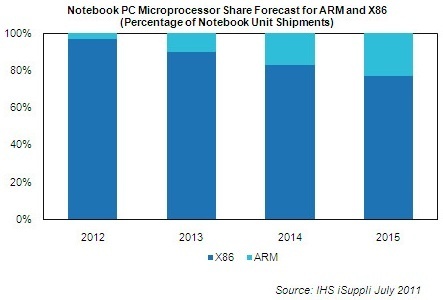 By the year 2015, Wilkins says that around 25 percent of laptops will have the ARM processors. And guess what? Windows 8 is ARM-enabled. Wilkins goes further and predicts that laptop manufacturers will jump into the bandwagon by making budget laptops using the new processors. By “budget” he means laptops priced below $700 – with a lot going as low as $500. While we do have these budget laptops today (at least based on the price alone), the major difference is in the processor. If – or maybe when – laptop manufacturers start using ARM processors instead of the current AMD and Intel ones, then we might just have more options for laptops that will free up more cash for other expenses. I am not too sure about the cause and effect situation as described by Wilkins ((Source)). Is the predicted rise of new low cost laptops (running on ARM processors) because of Windows 8, or is Windows 8 going to be more popular because of the ARM processors? Maybe it works both ways, or maybe I am missing something. In any case, the most important thing is that more budget laptops are in our future. The other day, I was walking around the mall when a huge display caught my eye in what usually is an open space. Samsung was holding a special exhibit, and special it was! The Series 9 laptops have been the talk of the town for a while now, although I don’t know too many people getting their hands on one. It seems, though, that Samsung has struck gold with this series, making their thin laptops a feasible alternative to Apple’s MacBook Airs. And if expanding the line is anything to go by, then Samsung has really done a good job with the initial offerings. The news is that there are new 13.3-inch versions which are part of the Series 9 laptops. First comes the NP900X3A-B01US, which comes with an Core i5-2467M CPU, 4GB of RAM, and a 128GB solid-state drive. This configuration will cost you a nice $1,349. If the 128GB storage is not enough for you (understandably, if the laptop is going to be your main computer, that storage space needs to be bumped up), then the next model might be more to your liking – the NP900X3A-B02US. It has similar specs to the previous laptop, except that the SSD is 256GB. The price tag for this configuration is $1,649. Now for the big boy – the NP900X3A-A05US. This laptop has a Core i7-2617M, 6GB of RAM, and a 256GB SSD – all for $2,049. Of course, it is to be expected that the additions to the line up includes smaller sized laptops. 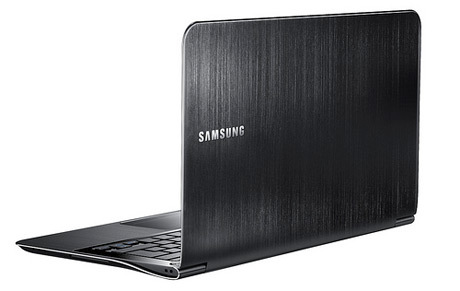 The Samsung Series 9 is also welcoming two new laptops in the 11-inch models. 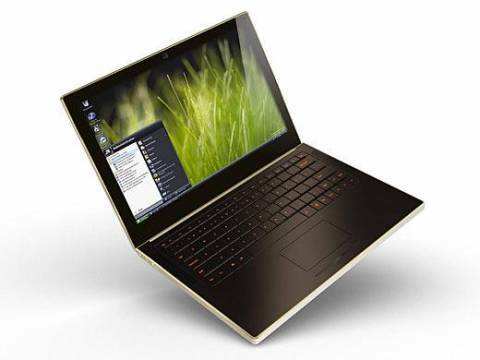 The NP900X1B-A02US has a Core i3-2357M processor, 2GB of RAM, and a 64GB SSD. The price is $1,049. The other option is the NP900X3A-A01US, with the same processor as above, but more RAM at 4GB and more storage space at 128GB (SSD as well). This is priced at $1,249. My first thoughts – beautifully sleek, but disappointingly pricey. Why would I want to go for these laptops if they are not way cheaper than the MacBook Airs? Then again, for people who want the look without leaving Windows, these laptops are perfect. Another thing going for these laptops is the material used to make the case – duralumin, which is supposed to be twice as strong as aluminum. Watch out for their release next month, although I hear some stores are already offering them on a pre-order basis. 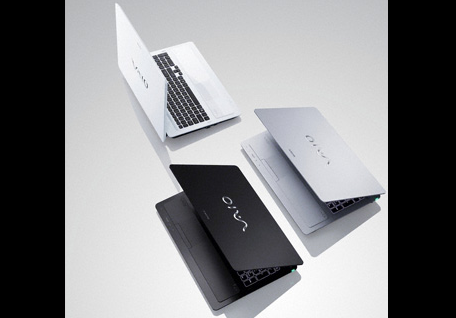 Sony has consistently delivered high quality products, especially when it comes to their Vaio line. Users of these laptops will attest to their performance, and no one can deny that they score a lot of points in aesthetics as well. Of course, there is the price factor, but people are willing to pay for quality anyway. If you are a fan of Sony products, then you might want to know that the newest in the Vaio line is now available on a pre-order basis on the Sony web site. Here’s the dish on the F series laptops. Inside, you’ll find Intel Core i7 quad core processors to make sure that you have the computing power that you want and need. Sony recommends that you run Windows 7 on the laptop, although you can always use your preferred operating system. You can choose between the 16-inch 3D display and the 16.4-inch 2D display. And yes, you read that right – the laptops are 3D compatible, allowing you the luxury of watching the latest 3D movies on Blu-ray. The selection may not be that brilliant at the moment, but 3D capability might come in handy in the future. Personally, I would opt out of the 3D functionality for now. Moving along, other key points about the F series include NVIDIA® GeForce® graphics and S-Force™ Front Surround 3D audio. As for the battery life, the 2D models can last for 2.5 hours on default settings and only 1.5 hours on DVD playback. This is rather poor, don’t you think? As for connectivity, it has the usual Bluetooth and Wi-Fi, plus it also has two USB 3.0 ports. The laptops are available in four colors – glossy black, matte black, premium white, and silver. Of course, you can configure the laptop to your heart’s content, but that probably means you will be paying more than the base price of $799. It seems that technology can do just about anything. From directing your every move, to what you’re going to eat for dinner, to using a reverse phone lookup. Even though their presence has increased in our lives, some companies are doing better than others. The PC hasn’t been doing to well for years now. Apple has been hitting the market, like clockwork, with increasingly newer and fresher innovations that, coupled with an aggressive marketing campaign, has made them a consumer favorite. Most Apple products are far more expensive than their PC counterpart but people are still driven to purchase these high-end machines. Some say that their increased reliability and brand recognition are just a few of the reasons for this success but PC’s aren’t out of the game. Some PC manufactures hope to revitalize their candidacy for supremacy in the computing market with newer sleeker laptops.